The spouse who files for divorce (the Plaintiff) must be a resident of Louisiana for at least 12 months before filing. Divorces are filed in the parish where either spouse lives or in the parish where the spouses last lived together as husband and wife. Article 102: the spouses must live separate and apart without reconciliation for 180 days after filing for divorce (365 days if minor children are involved). Article 103: the spouses must have lived separate and apart without reconciliation for 180 days before filing for divorce (365 days if minor children are involved). When you use DivorceWriter to create your Louisiana divorce paperwork, you can access both sets of forms at no additional charge. If you want to file for divorce immediately, but you and your spouse have not yet been separated for the requisite amount of time, you must file under Article 102. If you and your spouse have already been living apart for a few months, you might want to wait and file for a 103 divorce so that you can use that already accrued separation time to finalize your divorce fast as possible. 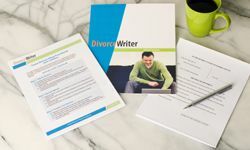 DivorceWriter provides forms specific to the state of Louisiana and offers a money back guarantee if your documents are not accepted by the District Court in your parish. You have qualified to use DivorceWriter to complete your Louisiana divorce papers online. Select "Continue" to start the interview.